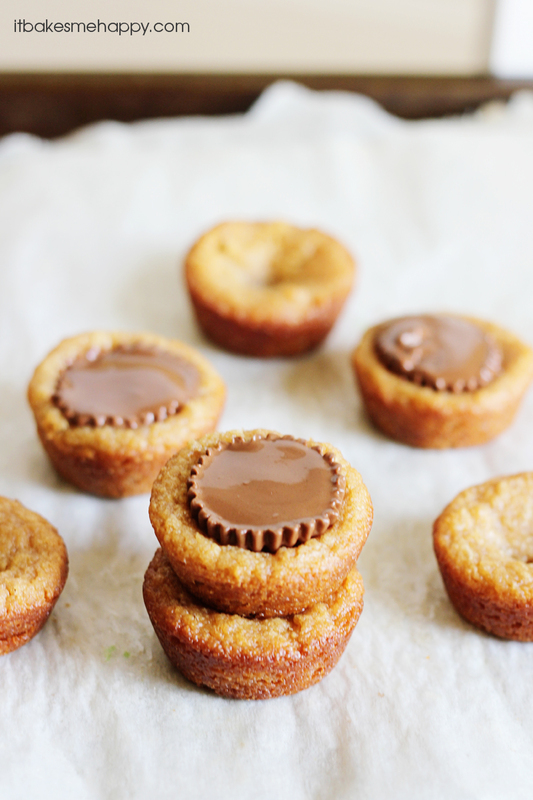 These Peanut Butter Cookie Cups are soft, delicious little bites of heaven stuffed with miniature peanut butter cups. I was driving home from the mall yesterday and trying to think of something to share with you all. So often my hubby gets disappointed when I don’t bake something for him, so I knew it needed to be something he would like. This recipe is one that my sister used to make so often when we were younger – that despite having gone vegan a few years ago, she still knows it by heart! I decided to opt for cookie cups instead of the traditional criss-cross cookies and to add his favorite candy, Reese’s Cups. The resulting cookies are soft, delicious bites of peanut butter heaven. Seriously, they are so good I doubt you’ll be able to eat just one! I may have eaten 3, okay 4 – but I’m having a baby in the next few weeks, so who’s counting. Enjoy and happy baking! Combine all of the ingredients in a large mixing bowl, stir until smooth. Using a 1 Tbs cookie scoop place 1 scoop of the dough into each well of a miniature muffin pan. Tap the pan on the counter to help the dough settle a little and using the back of a Tbs measuring spoon press the dough into the pan. Bake for 10-12 minutes until slightly golden. Carefully remove from the oven and place a Reese's Cup in the center of each cup. Let the cookies cool completely in the pan and then using an offset spatula remove the cookie cups and serve. « Gift Cards Galore Giveaway! CONGRATS!! You have been featured at The DIY Dreamer! YAY!! Come on over and grab your featured button, you deserve it! I find it bothersome that there is no flour and only egg as a binder. Is the end result actually a cookie or was something left out of the ingredients? I hesitate to make them without confirmation.